Hook & Loop Tape: 20mm Sew-In. 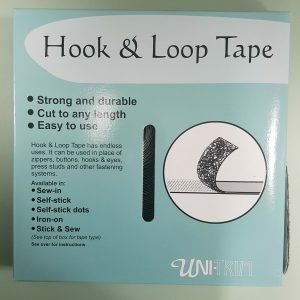 Hook & Loop Tape has endless uses. It can be used in place of zippers, buttons, hooks & eyes, press studs and other fastening systems. Sew-in tape can be sewn, glued, nailed, stapled, etc. it is washable and dry-cleanable. Hook & Loop Tape: 25mm Sew-In. 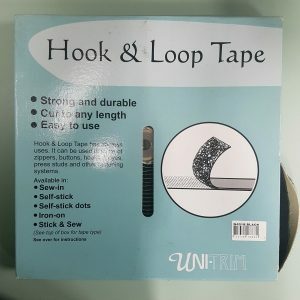 Hook & Loop Tape has endless uses. It can be used in place of zippers, buttons, hooks & eyes, press studs and other fastening systems. Sew-in tape can be sewn, glued, nailed, stapled, etc. it is washable and dry-cleanable. 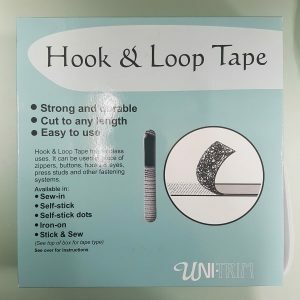 Hook & Loop Tape: 20mm Stick & Sew. 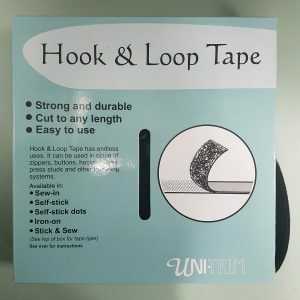 Hook & Loop Tape has endless uses. It can be used in place of zippers, buttons, hooks & eyes, press studs and other fastening systems. Stick & Sew Tape is ideal for sewing use, decorating or craft. Particularly suited to curtains, where self stick strip is attached to window, rod or pelmet and the remaining sew in tape is sewn to the curtain. Remove backing paper from tape and press firmly on to a flat clean dry surface. Other uses include hanging fabric wall hangings, quilts, affixing shoulder pads etc. It is washable and dry-cleanable. Do not wash or dry-clean stick on tape. 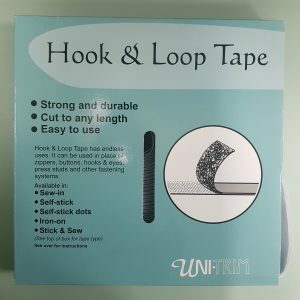 Hook & Loop Tape: 50mm Sew-In. 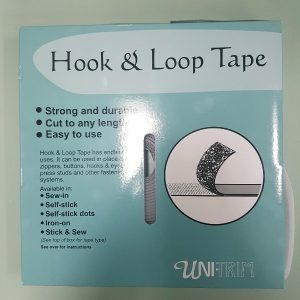 Hook & Loop Tape has endless uses. It can be used in place of zippers, buttons, hooks & eyes, press studs and other fastening systems. Sew-in tape can be sewn, glued, nailed, stapled, etc. it is washable and dry-cleanable. 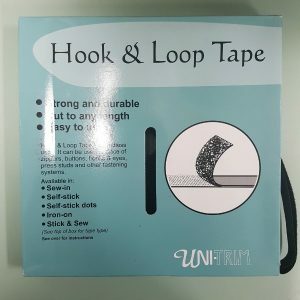 Hook & Loop Tape: 20mm Self Stick. 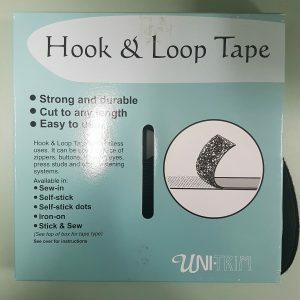 Hook & Loop Tape has endless uses. It can be used in place of zippers, buttons, hooks & eyes, press studs and other fastening systems. To use self stick tape, remove backing from tape and press firmly on to a flat, clean dry surface. Do not wash or dry-clean. 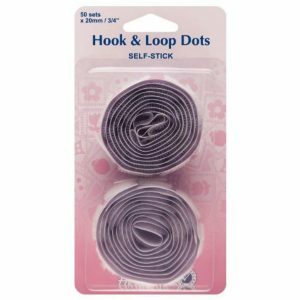 Hook & Loop Velour Fastening System – a Quick, Easy Method to Use in a Host of Sewing or Household Applications. 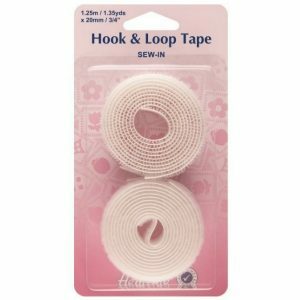 Sew-In Hook & Loop Tape: White Value Pack 20mm. Sew-In. Strong and hard wearing. 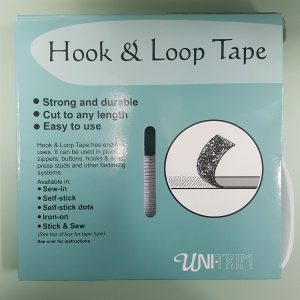 Hook & Loop Velour Fastening System – a Quick, Easy Method to Use in a Host of Sewing or Household Applications. 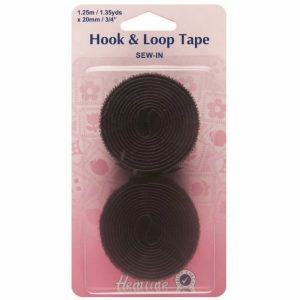 Sew-In Hook & Loop Tape: Black Value Pack 20mm. Sew-In. Strong and hard wearing. Hook & Loop Velour Fastening System – a Quick, Easy Method to Use in a Host of Sewing or Household Applications. Hook & Loop Dots: White 20mm 50 Sets. Value pack. Self-Stick. Hundreds of uses around the home, in the car and outdoors.